The Full moon party on Koh Phangan, Thailand has become the quintessential right of passage for many travelers to Thailand. Depending on who you talk to the full moon parties were started between 1987 and 1992 by a handful of backpackers who decided that the best place in the world to witness the full moon was along the crescent shaped beach at Haad Rin on Koh Phangan island. They began to organize small parties among friends at each full moon and over time word spread and the parties became much bigger. Since it’s auspicious beginnings the full moon parties have grown so much in popularity that it’s not unusual to see between 20-30 thousand people attending any given full moon party and that number grows dramatically during the New Years Eve full moon party. What once began as a small get together with maybe some acoustic guitars or a boom box now comprises multiple venues with world class DJ’s and multiple sound systems. In recent years the full moon parties have become synonymous with excess and known for rampant drug abuse as well as a huge upswing in the crime rate. There have been quite a few deaths and rapes associated with the event which is billed as the ultimate party experience. While there is a drug culture related to the full moon parties, drugs are illegal in Thailand and if caught you will face significant fines, jail time and or deportation and blacklisting from the country. Plan ahead and book accommodations early. With over 20,000 people attending each party you want to make sure you have a place to stay. If you want to party but don’t want to deal with the noise all night long book a hotel out of town. If you want to leave the island the day after the party book your boat in advance as they fill up quickly. Police enforcement is stepped up during the party and while they are there for your protection they are also there to make arrests if you get out of hand. With that in mind remember to look out for your own safety and while everyone loves to party it up doing so to excess could have very real implications. Listed below are the dates for the 2010 full moon parties. Keep in mind there is no full moon in February so there will be 2 parties in March. Cat, I can understand Thailand’s reasoning for wanting to stop the parties. Lots of drugs and criminal element around to take advantage of the partiers makes for a tough time for the local police. Indeed. Also, Thailand gets a lot of bad press due to the parties so can’t fault them there. Full moon party = No thank you ! I’ll stick to Pattaya. It has everything I want and none of the hassles or little kiddies. It’s kinda like Christmas Chuck…there’s the kiddie table and the adults table…Full Moon Parties are Thailand’s version of the kiddie table. Personally I don’t care for huge crowds so I’ll be giving them a pass. I can only imagine the insanity this year with the full moon coinciding with New Years! 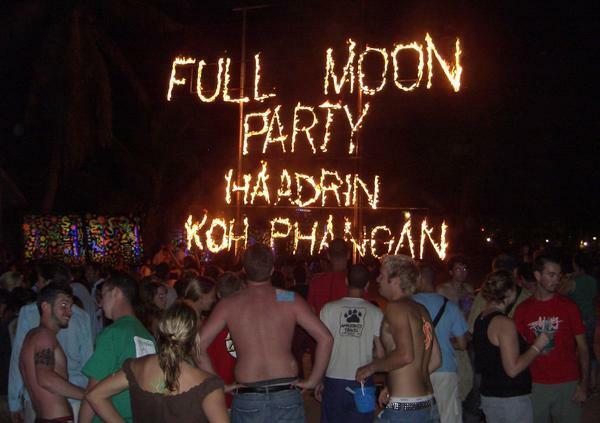 I’ll admit I did take in a full moon party once, but that was many moons ago (1997 – I’m dating myself huh?) It was a much smaller scene then and not as publicized as it is now. And of course much safer although the degree of excess was just as great. If you’re young then experiencing the full moon party once is a great idea IF you are able to do it safely! <– Not sure if that is an oxymoron? John, Sounds like life has changed you for the better and I can’t think of a better way to spend New Years…Cheers. Since it sounds as if the full moon parties were begun by a bunch of hippies, I would think the origin would be described as inauspicious. But what do I know? Happy New Year, Talenman. vange´s last blog ..Wordless Wednesday: NYE Style! Vange, technically they are dirty backpackers which makes it an auspicious event because it gave them an opportunity to get food and drink from others with little to no expense…Happy New Year ya wench.